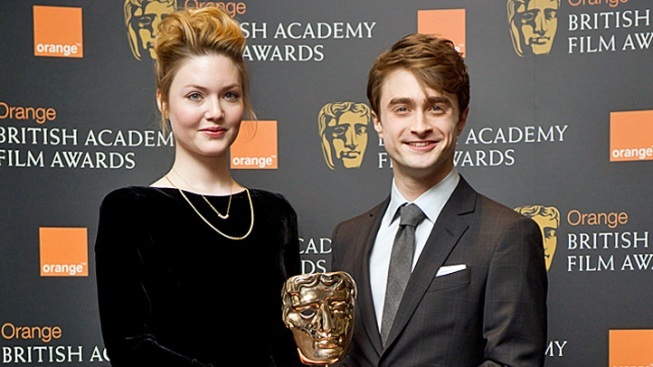 Holliday Grainger and Daniel Radcliffe announced this year's BAFTA nominees Tuesday in London. The British Academy of Film and Television Arts announced its nominations for this year's Film Awards in London Tuesday, with the help of "Harry Potter" star Daniel Radcliffe. Topping the list of nominees: French silent romance "The Artist," nominated for 12 awards, and taut British thriller "Tinker Tailor Soldier Spy," nominated for 11. Those much-lauded films hardly dominated the list of movies with BAFTA nods, though, with U.S. and British movies big and small rounding out the major categories' nominations. Along with "The Artist" and "Tinker Tailor," the other films nominated for Best Film were "The Descendants," "The Help" and "Drive." "Artist" star Jean Dujardin and "Tinker Tailor" star Gary Oldman compete with Brad Pitt ("Moneyball"), George Clooney ("The Descendants") and Michael Fassbender ("Shame") for the Best Actor award. And for Best Actress, Michelle Williams was nominated for her turn as Marilyn Monroe in "My Week with Marilyn," as were Viola Davis for her work in "The Help," Tilda Swinton for "We Need to Talk about Kevin," Berenice Bejo for "The Artist" and, of course, Meryl Streep for her portrayal of fomer British Prime Minister Margaret Thatcher in "The Iron Lady." In the run-up to the Oscars, the BAFTAs are regarded as a good indicator of how films will fare in the Academy stateside. They also serve, according to The Associated Press, as a strong platform for launching the international prospects of relatively small British films, like last year's "The King's Speech" and 2010's "Slumdog Millionaire." "My Week with Marilyn" and "We Need to Talk about Kevin" are two such low-budget British movies with multiple nods in this year's BAFTA nods. Read the full list of BAFTA nominations here.